in his cellar in Burgundy. One of the highpoints of our visit to Burgundy was our meeting with Philippe Colin in his cave in Chassagne-Montrachet. 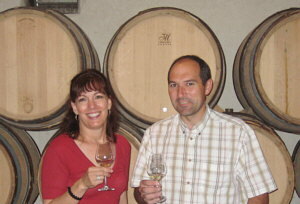 In 2004 the Domaine Michel Colin-Déléger was divided between Michel and his two sons, Philippe and Bruno. Philippe’s 2004 Chassagne-Montrachet was a knockout with a beautiful nose of white flowers and tropical fruit, lovely in the mouth with a pleasing acidity in the finish and a hint of citrus. We wanted to meet him, and with the assistance of Anthony and Stephany of Kermit Lynch Imports an appointment was arranged. We were informed that his English was very good. Nice news because our French isn’t all that hot. So we were very excited when we showed up at his door early one morning. The excitement quickly turned to a mild terror when we found out he hardly spoke English at all. But what a gracious man. He didn’t seem to be offended at all by our butchery of the French language as he led us through a barrel tasting of some of his yet to be released wines, and a bottle tasting of some older vintages. And despite the language problems we were able to communicate about the subject we all cared about – his glorious wines. If you are unfamiliar with the white wines of Burgundy, this would be a good place to start and find out what can really be done with a chardonnay grape. I have to warn you, though, once you’ve discovered these wines, there’s no turning back.